Kerala, the God’s Own Country is steeped in traditions that form a mode of connecting to the divine and seeking blessings. Arguably, one of the most literate states of India, alongwith technology, it has kept alive its deep rooted customs, thus saving them from becoming outdated. One such tradition or rather dance ritual is Theyyam, which is more than 2000 year old. 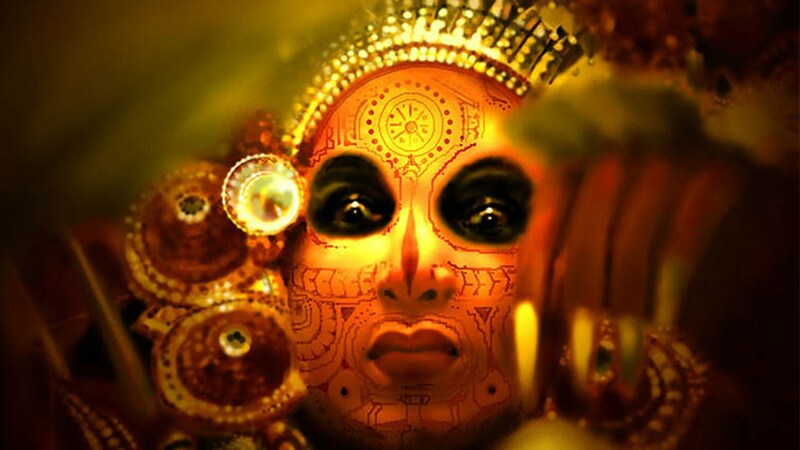 The word Theyyam has been coined from Deivam that means God in Malayalam. Theyyam is a Hindu dance ritual that originated from Northern Malabar. It encompasses dance, art, drama and music in the most ancient way, thus making it unique. 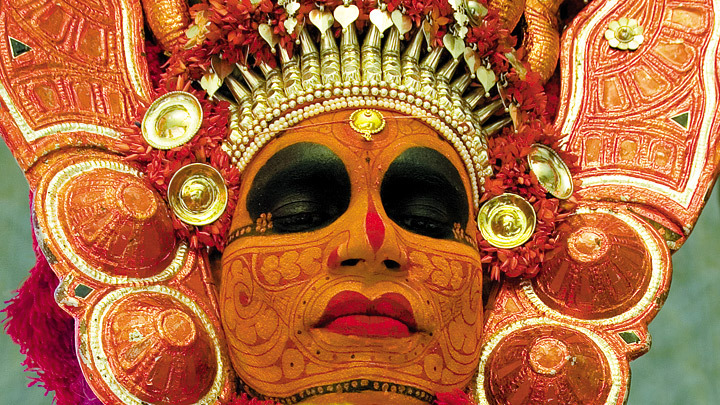 The dancers who perform Theyyam are believed to be special and have a god like status. They don’t consume meat or alcohol and live an ascetic life. Theyyam’s ceremonial dance is assisted by musical instruments like Veekkuchenda, Kurumkuzal, Chenda and Elathalam. You will be surprised to know that there are almost 400 types of Theyyams, each differ in music, costumes and choreography. Most popular of these are Raktha Chamundi, Muchilottu Bhagavathi, Kari Chamundi, Wayanadu Kulavan, Gulikan and Pottan. Raktha Chamundi – Dedicated to Goddess Kali, who had a fierce battle with a demon called Rakta Bija. This demon got a boon that he will be reborn even from a drop of his blood that falls on the ground. Hence the Goddess took a ferocious form and drank the blood, before its fell on the ground and another Rakta Bija is born. That is why She is called Raktha Chamundi and this Theyyam is perform in Her honour. Muchilot Bhagavathy – Chief goddess of Vaniya Nair community, She is the source of prosperity, knowledge and benevolence. She is believed to have been incarnated with a prasadam that had the power to cure the most incurable diseases. The Goddess appeared on the earth in the form of a flame to eradicate evil. Kari Chamundi – Legendary Goddess Mahadevi, whom this Theyyam is dedicated, is considered a great sage who wages a battle against Sobha Nishabhasriya. She alongwith Goddess Karinjamundi form the theme of this ritual. It is popular in the Thaidekadavan, Vannan and Pulayan caste. Wayanadu Kulavan – In the hills of Wayanad lived Wayanad Kulavan, who was skilled in archery and martial arts. He had a great knowledge of agriculture, and worked very hard to replenish the hill slopes. Because of his tireless efforts the area is blessed with thick forest wealth and since then his life and efforts are being enacted in this dance form. Gulikan and Pottan – Gulikan is the chief warrior of Lord Shiva and Pottan symbolizes the goodness over evil. Both of them were great heroes and laid down their lives for great causes. They are considered as ancestors and hence are worshipped as a hero. 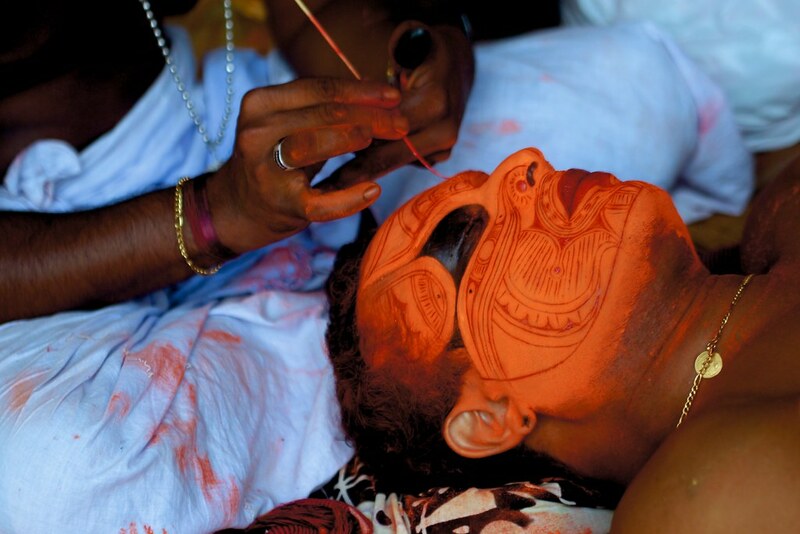 Theyyam attracts every eye with its elaborate make-up and dazzling costumes. The dancers wear a headgear called Mudi and make up Mukhathezhuthu; that goes perfectly with the dance theme. Natural organic colours are being used and applied according to the theme of the dance and legend. The makeup known as Mukhathezhuthu, forms the medium of communication. Main colours used for it are red, yellow, black and white. Eyes are mostly highlighted with black. Peak season for Theyyam performances are November and December. The temples all over the northern Kerala have multiple performances which make for numerous itineraries. Perumthitta Tharavadu in Kottamkuzhy is the best place to see this ritual performance. Kannur, Kasaragod, Wayanad and Kozhikode are perfect to witness elaborate celebrations.